We recently met with Alena (Ali) Fibichová of Hideout Bali. Hideout Bali is a business offering sustainable holiday accommodation in Indonesia. Ali and Jarmil, the Czech founders of the business, truly capture what it means to work remotely and flexibly. Why? They live in Bali, a remote Indonesian island. A paradise to many. In Bali, they are able to work in the mountains, in a cafe, or on a beach. Anywhere, really. Building a successful business is hard enough in your own country, let alone 7102 miles away. How did Ali and Jarmil make the transition from their lives and careers in the Czech Republic to starting a business in Bali? Four years ago they took a huge risk and have since achieved a degree of personal growth and freedom that they didn’t anticipate. Hideout Bali’s story shows how to successfully make a bold and daring choice in life: to create a lifestyle that allows you to work anywhere. Ali, can you tell me a bit about your background and what led you up to where you are now? I completed a bachelor’s degree in human resources, psychology and education. I then worked in HR until I was about 25 or 26. That led to me landing the position of HR manager for Red Bull in the Czech Republic. I worked there for a few years before I met Jarmil. Jarmil has a degree in musical engineering. When I met him, he had a job as a tennis player and coach. Shortly after we crossed paths, he decided to travel all across South-East Asia. He stayed in Bali, fell in love with the land and invited me over. We decided to give our normal lives a break. 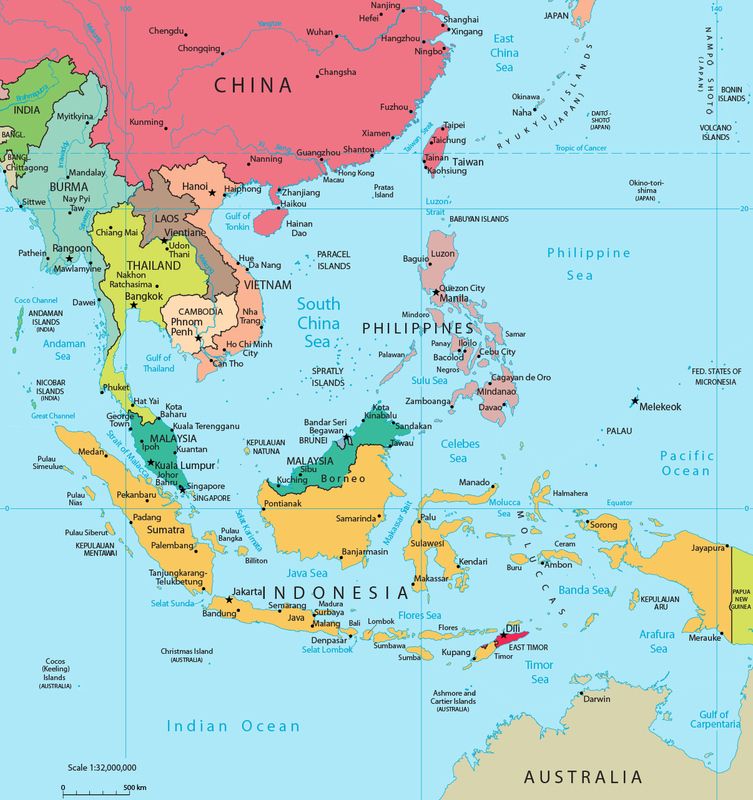 How was the change of moving from the Czech Republic to Bali? Actually, it was my first experience of Asia. The most difficult thing about the move was changing from a full-time position to a flexible one. It was tough because you lose that sense of structure and obligation. I had to push myself to make things happen. Did you go to Bali with the intention to set up this business? When Jarmil lived here, he planned to build a hotel. After I arrived in Bali, we started to think of creating something less ordinary. Something more ‘fresh’ in appearance. Neither of us had a background in architecture or construction. So we initially tried to build just one bamboo house. We were on a really low budget, so we asked the Balinese carpenter, who built our wardrobe, to help us out. He helped us to build a house in three or four months and that was the start of Hideout. Did anything else push you into the decision? We always loved how Airbnb helps any individual to become more self-reliant. Airbnb really gave us a new start and new options on how to make a living in fun and creative way. These options helped prompt us to start the business. We wanted the accommodation to be open to nature. We envisaged HB to be a getaway from the city and the busy, office-based working environment. Our intention was for this environment to be a retreat. A hideout. A hideout from your normal life and everything that you have going on. What exactly is Hideout Bali as a business? Our ‘Hideout’ business focuses on true, adventurous living. We always thought that hotel accommodation was very boring. That is, you rent a room, sleep there at night but always want to get out during the day. We wanted to create something amazing. A place where you can come, enjoy your time, be in awe of what is there and not want to leave. That is what we did. Is Hideout Bali the only building? There are two separate buildings. The older house is Hideout Bali. Next to that is Hideout Lightroom, it’s bigger and is more of a ‘modern apartment’. 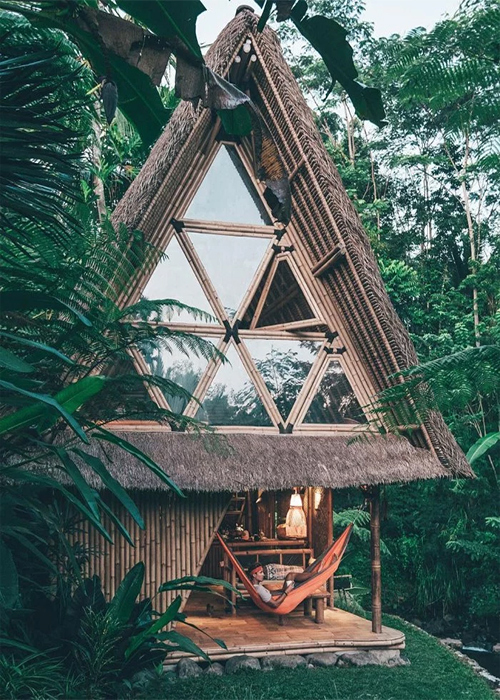 We also have a Hideout in Prague, our hometown and are now building a third house in Bali. We decided to use the word ‘hideout’ in all of our ventures to try and create a brand. Where exactly in Bali is it? It’s right under the volcano (Mount Agung) near Besakih, which is the biggest Hindu temple in Bali. We are in a district called Karangasem. It is the oldest region in Bali. It’s where the Balinese king used to live and where his descendants continue to live until this day. We are in the old, old Bali. What were the challenges when you started up the business? One of the biggest challenges was moving abroad and all that comes with it. The different language, the different traditions, and the different approach to work. For me, it was difficult moving from a full-time job to becoming more self-reliant. I also found it hard to adapt my work ethic to a different culture. In the first few months, we were struggling to get going and get started. We also struggled to get the materials and get people working. Around this time, we grew very close to a local Balinese family who we lived with, in the mountains. They are the ones who helped us get started. They now help us to do a lot of the work. They take care of the Hideout Bali as it is. I wouldn’t call them employees. We are just one big family taking care of it all. We call ourselves the Airbnb Hideout family because we consist of 2 brothers, one cousin, his wife, Jarmil and me. How did you make a living for yourself during the construction phase? We ran out of our budget for construction. We didn’t have any outside income. So, we were just spending what we earnt on the build. It was a huge risk. Eventually, we slowly started to get the first guests. It was hard to show them our enthusiasm considering the hardships we were going through at the time. Then, the business really started to take off and now it is our main source of income. Why did you choose bamboo out of any other construction material? Oh, because we love bamboo! 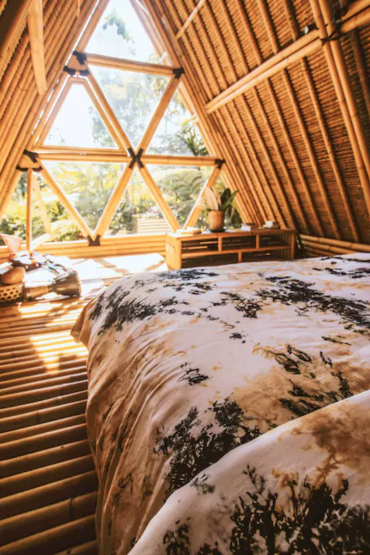 Bamboo is the most sustainable building material in the world. It only takes 3 years for bamboo to grow to such a way that it is ready to be cut and built with. The second alternative is a tree, which can take up to 60 years. Bamboo, as a plant, produces a lot more oxygen than trees and can absorb a huge amount of carbon dioxide. You can feel the atmosphere is different when you are in a bamboo forest. Bamboo is also a great ventilator and is very durable. It’s great at withstanding certain temperatures and is extremely strong. It can last a very long time if you preserve it and take care of it. 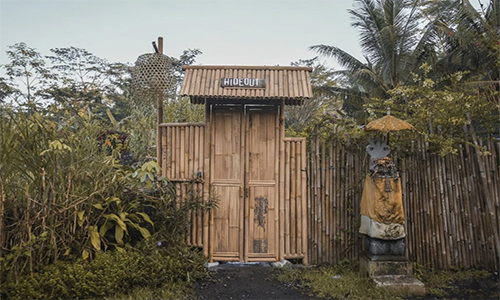 Have you tried to make Hideout Bali sustainable in other ways? Or is Hideout Bali only sustainable because of the building materials used? When we started, around 2014 or 2015, we developed a hydropower system. We did this using water wheels, on the river, next to the Hideout Bali building. This was our first project during the first 6 months and it took a lot of effort. We managed to get it working and we were 100% sustainable for a few months. Unfortunately, the river next to us is very unpredictable and can flood during the rainy season. As a result, the device has already been destroyed 3 times. Since then, we have only used the water wheel to get water and not electricity. However, we do hope to use this system again in the future. 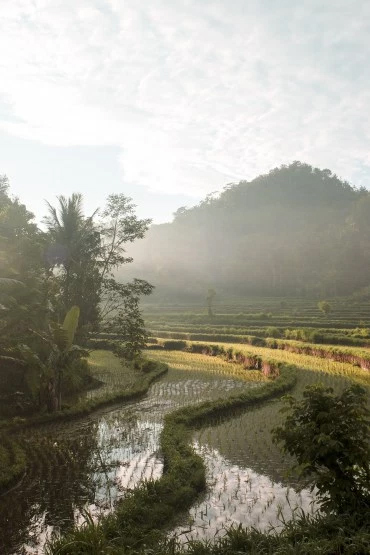 Additionally, we have installed a bio-septic system which takes care of wastewater from Hideout Bali and from the local village.This prevents waste from seeping into the river. How long do guests typically stay for? Most people stay 2-3 nights. We’re fully-booked often four months in advance. We usually have 4 guests on the land, 2 in each house. How long do you typically need to book in advance to stay here? Usually, when we have a vacancy it’s booked within two hours of posting. Do you prefer working flexibly as opposed to what you were doing before? At first, I missed the feeling of being safe, as being employed provides a safety net. Yet, there is nothing to describe it, being on your own and working your own hours. It’s given us a freedom that I could never have imagined. How flexible is your current job? Well, I spend a lot of time at my computer. I need it to keep track of guests, emails, enquiries and promotional marketing work. All I need is an internet connection. If I were to use the term flexible working, what words would you think of? It allows you to have a more colourful and fun life and it gives you more time to contact your family and friends. What are the challenges of working where you are? Not having colleagues to consult with or moan to! Not having people who speak the same language. The lifestyle can be distracting. Where do you usually work throughout the week? Do you typically work in one place? Yes. I mostly work on my porch outside, in the mountains. So, you have flexibility over where you work, but you choose to work on the porch? Does that flexibility of location benefit you? Yes. It keeps me saner, I guess. If you were to pick an ideal working space where would it be and why? Are you currently working in that space? I currently work there. As I said, I mainly like to work outside, on my porch. I still like the choice of being able to work anywhere, though. I can work on the beach if I want to but I don’t because I am afraid my computer will get broken! I can work anywhere because all I need is my MacBook, an internet connection, and a drink. I can even drink something alcoholic since I don’t have any employers to check up on me! Why do you prefer working outside? I think it’s because I worked in an office for years. There, I was used to only having a partial view out the office window. In Bali, it’s beautiful outside and there is amazing weather. I like the fresh air. It feels more natural to be outside than inside a room. Do you get good internet connection out there? Yes, you can, actually. You can get internet connection almost anywhere. There are a few providers with quite strong connections here. What are your future goals for the business? We are playing with the idea of expanding Hideout into other places. We are thinking of using bamboo in places that we are not so familiar with (e.g. India or the Seychelles). Are there any companies or individuals that are inspirational to you? When we started the bamboo buildings, we got a lot of inspiration from John Hardy and Elora Hardy. They’re very cautious about the environment. They own an architecture company in Bali. They designed and built the Green Village, Green School and Bamboo Indah (a boutique hotel). We discovered it was very expensive to stay in their bamboo hotel. It was about $1000 dollars a night! Most people can’t afford that. 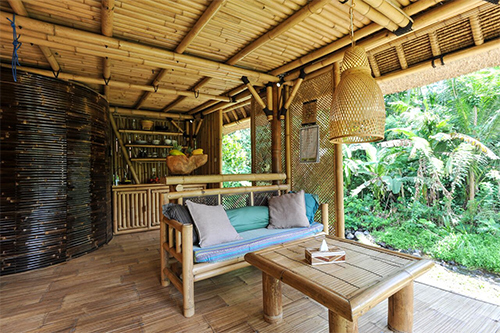 So, that’s why we decided to create a bamboo house for regular folks to go in and enjoy. How did you make Hideout Bali cheaper and more accessible to the public? Did you get help from the family you had built there and the local community? We are currently living in a very small village where everyone knows each other. The locals make us feel very welcome and help us out. We also do everything with them. We are there for the ceremonies, weddings and newborns.